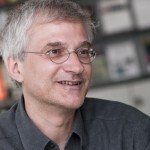 Thomas Ertl is a full professor of computer science at the University of Stuttgart, Germany and head of the Visualization and Interactive Systems Institute (VIS) as well as the Visualization Research Center (VISUS). He received a MS in computer science from the University of Colorado at Boulder and a PhD in theoretical astrophysics from the University of Tübingen. His research interests include visualization, computer graphics and interactive systems and he is one of the internationally leading R&D-specialists in the field of visualization. Ertl is coauthor of more than 300 scientific publications and he served as chair and on the committees for most of the conferences and journals in the field. He was Editor-in-Chief of the IEEE Trans- actions on Visualization and Graphics and he is Chairman of the Eurographics Association. He received the Outstanding Technical Contribution Award of the Eurographics Association and the Technical Achievement Award of the IEEE Visualization and Graphics Technical Committee in 2006 and he was elected as a Member of the Heidelberg Academy of Sciences and Humanities in 2007.